Prominent & Leading Service Provider from Mumbai, we offer fire safety audit. 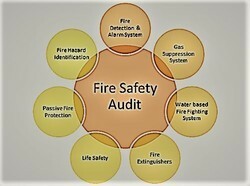 Providing professional services of Fire safety audit. We provide all kind of Fire safety audit and Fire protection consultancy services of buidlings and other premises. In this stage we get the required input from clients and client engineern incharge, Manager against reciept of formal, official work order or appointment letter. Prepartaion of basic data fixation documents and scheduling inspection dates and timing in coordination with the premises concerned department official for fire safety audit. A circular should be issued to all the concerned departments, respective agencies authorizing auditor to carry out the premises audit for Fire safety and authorization of right to entry in the premises with a view to conduct the audit. Client shall ensure that, notice should be issued and displayed to the concerned premises authority/ sites with a circular informing the staff of the premises that the audit is compulsory and statutory and is for their safety only. Visit to the site & carry out the detail inspection as per the requirements/guidelines & standards. To inspect test wherever required, check conduct any tests using testing instruments, record and tabualate all the short comings and safety measures to be taken. Looking for Fire Audit and consultancy services ?